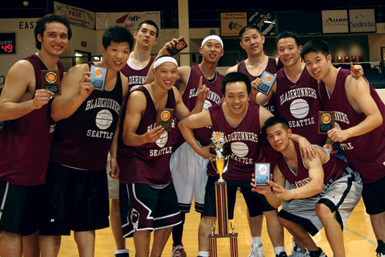 With already 3 titles in the past 4 years, the Seattle Bladerunners cemented their place in NACBA history by capturing their 4th Men's Elite Championship at the 28th Annual NACBA Chinese Invitational Basketbal Tournament on Monday, May 26, 2008. Player/coach Rich Yu, returned with his talented veteran laden team after a one year hiatus and showed they still can hoop it up with anyone. What an historic start! In the first ever Men’s Elite Championships at the NACBAIT, the level of competition was even greater than anticipated. With 16 hungry and megatalented teams with their eyes on the prize, the competition was stiff from Pool Play Saturday through Final Four Monday. Saturday was a real fight to the finish, as the Medal Round brackets for the next day were not completed until the very last game of the evening at 8:30 pm. After the twelve Medal Round teams had finally been determined, the remaining four teams headed to the Consolation Round. From 1-16, the caliber of teams this year was unsurpassed. In the Consolation Semifinals, the NY Rockits AIA (who had defeated the Pool winning SF Wildcats the day before) met up with Joe Brush and the Boston Knights in a physical game. These teams last met in the First Round of the playoffs at the 2006 NACBAIT, with Boston barely escaping that meeting in a controversial win. We knew this one would be a heated rematch, with both teams looking to salvage some semblance of victory before heading home. After a shockingly rough exchange between Jeff Pham and Kevin Chin, the rest of the players calmed down and guard Chris Chin (20 pts, 3 treys) led NYC to a 55-37 win. Sunny Luk paced the Knights with 11. The other semifinal game pitted the Cali Davis Dynasty (without the services of Harvard’s Jeremy Lin) and the Texas Ballistics (without their top player James Mao, who was injured). Texas is a perennial contender for the Final Four (2002, 2004, 2005) and had defeated the Seattle Bladerunners in pool play the evening before, while the Dynasty was a playoff team last year in their first NACBAIT appearance, so the fact that both of these teams were meeting in the Consolation Round showed what sort of competition they had faced on Saturday. The game was a classic, with the lead yo-yoing between the 2 squads. Texas swingman Ronald Lim (14 pts, 7 rebounds) was really on his game in this one, while the Dynasty’s top player was guard Brandon Lewis (18 pts, 2 treys, 2 steals). When the final buzzer sounded, Cali took the game 48-47, but if the game went another 30 seconds, who knows what could have happened. In the Consolation Finals, neither team was very productive on the offensive end during the first period, as the score was only 15-12 Dynasty. The Rockits were shooting themselves out of the game, hitting only one threeball, despite having several good open looks at the rim. After the break, the Rockits started to get the ball into NACBAIT Top 25’er Kevin Low (8 points, 6 boards) to make Cali spread the defense. After that, Chris Chin (17 pts, 6-7 ft, 3 rebounds) got into the action and it was a game. But NY was still trailing and had to put Cali on the line. They Dynasty sank 14 second half freebies to earn the win 43-37. MVP was Yitao Sun, as he popped 3 well timed trifectas in the game. In the First Round of the Medal Playoffs, the eight 2nd and 3rd placed teams in each group battled each other for the right to face the four pool winners from day one. The first game at 8:00 am was the 2004 NACBAIT Champion Boston Hurricanes AAU v/s the laissez-faire offense of the Arizona Desert Jade. The game began looking like it was going to be a harsh one for Boston, as athletic Canes forward Jimmy Cheng had sustained an Achilles injury the night before, leaving them with one less gazelle to run against the stacked AZ team. As expected, Arizona tried to outscore Boston and put the game out of reach early, outleting the ball quickly, taking it to the hole strong, and swinging the ball for 5 first half treys whenever the Canes collapsed on the Desert Jade drivers. Guard Bennett Woodward (17 pts, 6 rebs) had 13 first half points to lead Arizona to a 34-24 halftime edge, as the Canes went an ugly 0-7 from 3-point range. In the second half, PG Mike Yih brought his “A Game” to the court, dishing for 4 assists and scoring 7 points. But Boston continued to struggle from the outside, hitting 0-13 threes in the game. The Canes did manage to sneak back in the game as Desert Jade carelessly turned the ball over or missed shots on 4 straight plays. With under a minute to go, the Hurricanes executed a textbook play off a missed Arizona FT, bringing them to within 2 points and Boston was right back in the mix. But in the end, Arizona finished the game off from the line, earning a 57-52 decision. Ricky Chan had 13 points, 13 rebounds, and 1 block for Boston. Next up was a matchup of 2 Final Four teams from 2007- the hungry NY RL Cruisers and the “been there, done that” defending Champion NY USAB Gold squad. This game drew quite a decent crowd for a 9:00 am tip-off, with many onlookers curious to see which of these programs would earn NY’s boasting rights for the upcoming year. Last year, USAB came out of the blue to reach the Final Four and then gutted out a classic win against a shortrostered Cruisers team in the Semis. But the Cruisers surely remembered what it felt like to lose the big one to a cross-town rival in the most important tourney of the year. This year the Cruisers addressed their roster concerns, adding a good number of role players to help them get back to the Promised Land. As expected, the conservative Cruisers went to PF Tony Hu (19 pts, 11-13 FT, 9 rebs, 2 assists) right off the bat, as he continually backed the USAB big men down to point blank range for chip shots and free throws. But USAB was able to stay in the game throughout the first half thanks to a balanced scoring attack, trailing only 19-17. With about 13 minutes to go in the second half, Cruisers Eddie Wang (12 pts, 3 treys) and Quincy Tso sank some deep shots after crisp ball movement against the USAB trap left the defense scrambling. This seemed to take the air out of the USAB Gold game, and the Cruisers finally earned themselves some breathing room. The Cruisers were able to hit 11-12 second half free throws to ice it, 49-33. USAB got strong games from Joe Vines (10 pts, 7 rebs) and Nick Mui (7 pts, 1 steal).